Vintage 1940s/50s faux fur persian lamb jacket. Astrakhan, or Persian lamb, is the fleece of the Karakul lamb, which is black and tightly curled; I can promise you that no lambs were injured in the making of this soft, luxurious, and most cosy of jackets! It is, however, a very fair imitation: only if you have felt the real thing would you know the difference! It's a short, edge-to-edge style, without buttons, with two pockets and a shawl collar. 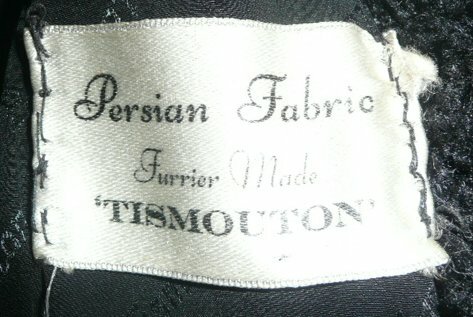 The label reads, 'Persian fabric Furrier made "Tismouton"' and the lining carries the brand name. In excellent vintage condition, with no apparent flaws, it can be dressed up or look good - as here - worn causally. It will fit up to about a modern UK size 18. Approximate measurements are: chest 46 ins/117 cms; upper sleeve seam: 24 ins/61 cms; lower sleeve seam: 19 ins/48 cms; length: 29 ½ ins/75 cms.